Williams » Sustainability » News & Events » What Happens in the Bathrooms of the Envi Center? The bathrooms at the Class of 1966 Environmental Center are the only ones on campus with informational posters about the toilets lining the walls, but at first glance they don’t seem much different from any other toilet on campus. It wouldn’t appear to take much thought to press down on the flush button, but the waterless toilets require more engagement than the others. They’re “composting toilets,” and the posters are there to show both how to use the toilets and what occurs after you’ve left. There’s more to the story than what happens inside the bathroom. Users press a flushing button on the back of the toilet before and after using it so a thin, concentrated foam that acts as a water substitute can lubricate the sides of the toilet. However, this liquid is more for human comfort and a sense of cleanliness than toilet function – with or without it, the composting toilet will do its job well. Besides this, the rules are simple – just don’t throw anything into the toilet besides toilet paper and waste. 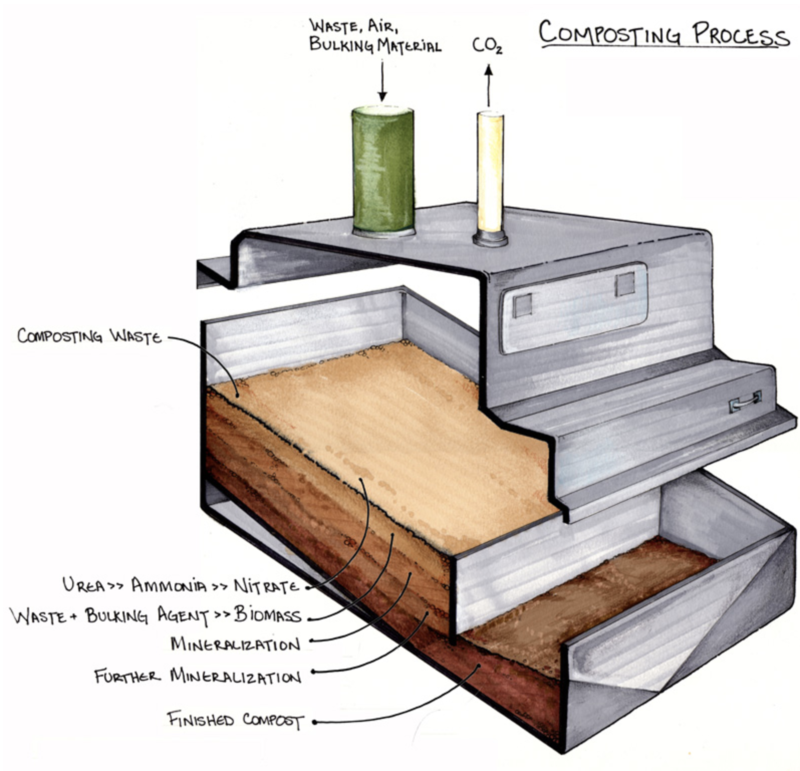 While the instructions are simple enough, the composting process going on below you is a little more complex. The solid waste is collected in the basement of the building in a composting bin to decompose and create odorless, nutrient-rich organic matter. Urine, which is not able to be legally composted in Massachusetts, is syphoned out and stored in a separate container, which is emptied out several times a year. 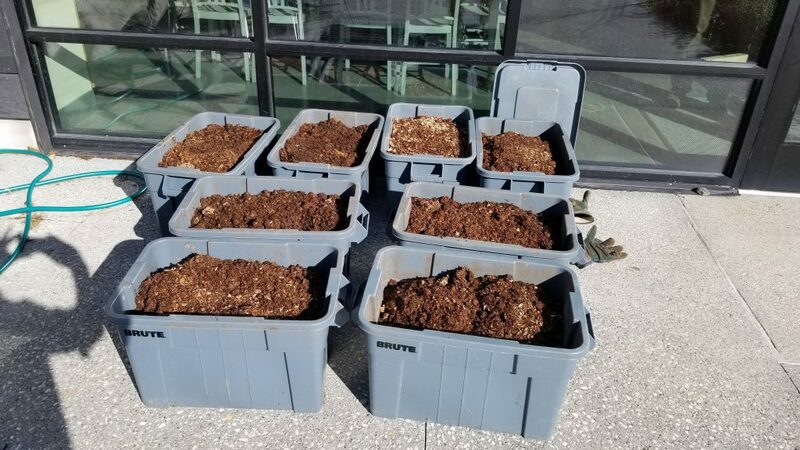 New waste goes immediately to the composting chamber, where with the help of copious amounts of sawdust, oxygen, and worms, it will dry up in moderate temperatures ranging from 65 to 113°F. These dry, aerobic conditions encourage microbes to break down the waste so it decomposes odorlessly – a wet compost pile will prevent healthy bacteria and microorganisms from obtaining oxygen and functioning. You would expect a compost pile to smell bad, but a successful batch will smell earthy and slightly sweet from the wood chips. A gentle fan inside the toilet that vents out near the roof further prevents an odor from existing in the compost bin. The end product is 95% carbon dioxide and 5% compost after two to three years of decomposing. Since the building opened in the spring of 2015, the bin has been emptied twice. Under Massachusetts law, the physical remainders can be disposed by “burial on-site or in another manner and location approved by the local Approving Authority, covered with a minimum of six inches of clean compacted earth,” meaning the Zilkha Center scouts meadow locations away from gardens or agriculture, so it can be returned to the earth as fertilizer. The last two land applications have occurred on the Oakley Center’s grounds. The composting toilets require more maintenance from operators and consideration from users, but the end result decreases water use drastically and gives back to natural areas. They’re even popular with visitors, who frequently take photos in front of the composting toilet bin for the “Wall of Fame” during tours of the Envi Center. Next time you find yourself in the ’66 Center bathrooms, don’t be intimidated by all the posters – consider them bathroom reading to pass the time instead.